The Feast of the Chair of St. Peter celebrates the papacy and St. Peter as the first bishop of Rome. 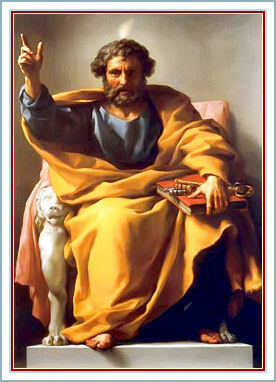 St. Peter’s original name was Simon. He was living and working in Capernaum as a fisherman when Jesus called him to be one of the Twelve Apostles. Jesus bestowed to Peter a special place among the Apostles. He was one of the three who were with Christ on special occasions, such as the Transfiguration of Christ and the Agony in the Garden of Gethsemani. He was the only Apostle to whom Christ appeared on the first day after the Resurrection. Peter, in turn, often spoke on behalf of the Apostles. In saying this Jesus made St. Peter the head of the entire community of believers and placed the spiritual guidance of the faithful in St. Peter’s hands. However, St. Peter was not without faults. He was rash and reproached often by Christ. He had fallen asleep in the Garden of Gethsemani instead of praying, as Jesus had asked him to do. He also denied knowing Jesus three times after Christ’s arrest. Peter delivered the first public sermon after the Pentecost and won a large number of converts. He also performed many miracles and defended the freedom of the Apostles to preach the Gospels. He preached in Jerusalem, Judaea, and as far north as Syria. He was arrested in Jerusalem under Herod Agrippa I, but miraculously escaped execution. He left Jerusalem and eventually went to Rome, where he preached during the last portion of his life. He was crucified there, head downwards, as he had desired to suffer, saying that he did not deserve to die as Christ had died. The date of St. Peter’s death is not clear. Historians estimate he was executed between the years 64 and 68. His remains now rest beneath the altar of St. Peter’s Basilica in Rome. Responsorial Psalm: The Lord is my Shepherd, there is nothing I shall want.